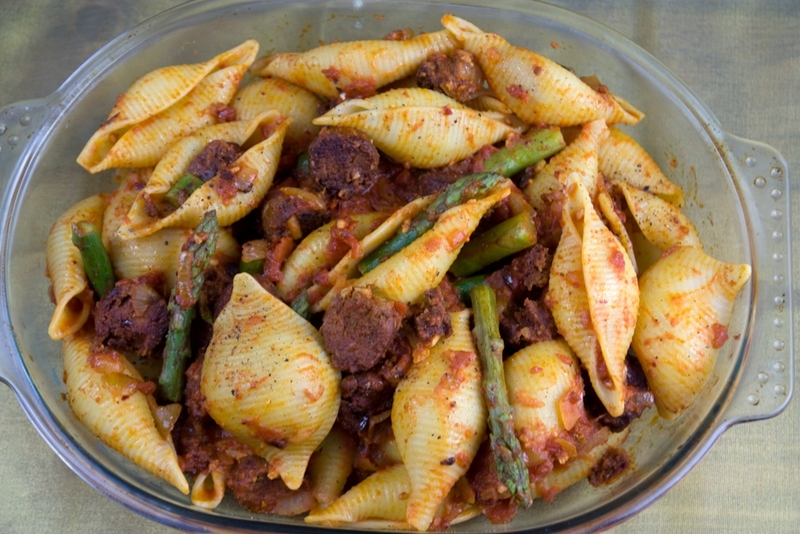 I have mentioned before that one of the most popular recipes on my blog is the vegan Chorizo sausages made with vital wheat gluten thanks to Terry Hope Romero. Since vital wheat gluten is a lot more accessible now and stocked by many health food stores across the UK,including most cities in Wales. I have been making it every year, but this is not to say that we indulge in faux meat all the time or that our meals have to be 'seitan faux 'meat' and two veg', its is actually not as I still find the texture of faux meat, especially seitan 'meat' unusual. For a veggie Sunday Roast, I would still always favour a nutroast in place of a 'Seitan' Roast with Stuffing. However, saying all that I do like to experiment and those of you who know me now through blogging, will know that I do enjoy experimenting in the kitchen with new ingredients, but always with fruit and vegetables. After all, I am sure if you do your research, my humble blog would have been the first in the UK showing the versatility of fruit and vegetables, for example putting vegetables, other than carrots, parsnips and pumpkins into desserts, but lets ignore that. Back to the the vegan chorizo sausages recipe which makes six. We often consume them all before the week is over incorporated into different meals. I actually made this Spicy Tomato Pasta with Vegan Chorizo Bake last year when asparagus was in season, but you don't have to wait for the asparagus season to kick in, you can replace the asparagus with broccoli, frozen green beans or even peas. This Spicy Tomato Pasta with Vegan Chorizo Bake was really delicious and quite comforting to eat too. You can grate some cheese over the top, but it is not necessary as the dish is packed with plenty of flavour and textures. Preferably in the same pan that you used to pan fry the chorizo, heat the oil, then add the onion and saute until very soft, then stir in the garlic, oregano and chilli flakes for a few minutes. Then stir in the chopped tomatoes and cook for 15 minutes until it begins to thicken. 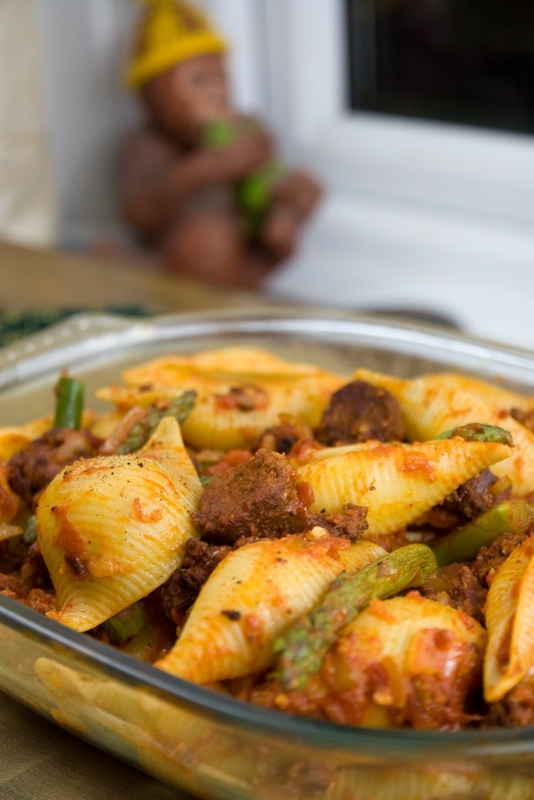 Stir in the cooked pasta and asparagus, green beans or peas and combine well for the sauce to coat. Season to taste with salt and pepper, then carefully stir in the cooked chorizo, trying not to break it up until it is evenly distributed. Transfer to a deep dish and bake in oven for 20 minutes. Adapted from Delicious Magazine meat and dairy version. I think The Italisn veggie sausage would be a good as a change, though it would not be spicy like the chorizo. Thank you Teresa and for the comment about the header. My husband insists every year that I have a new header, he creates them for me. I bet that's a really warming, hearty meal. With recipes like this you're definitely on the way to persuading me that my seitan aversion is misplaced. Where do you get your large shell pasta from? I keep seeing recipes with mega-shells and I really fancy trying them out. I can understand your seitan aversion as I do still have reservations about it, but i think little is better than often, we should really eat more fruit and veg, rather than substitutes. I can't rememeber for sure where I got the Jumbo shell pasta, but I think it was Tesco as its close to where we live (not that I like it) i prefer Asdas a lot more these days. Defenitely a dish for me! Looks so good! Thank you, I know you have made the chorizo recipe many times, so you know how versatile it can be. I like that you say you prefer a nut roast over seitan - but also love the you experiment so much as I have learnt so much about new fruit and veg and products from reading your blog - and indeed it is one of the long stayers (long may it last). I love the sound of it in a pasta bake. I am too busy to make my own sausages these days but I can always buy them at least. PS new header is a lovely picture! This sounds super delicious! 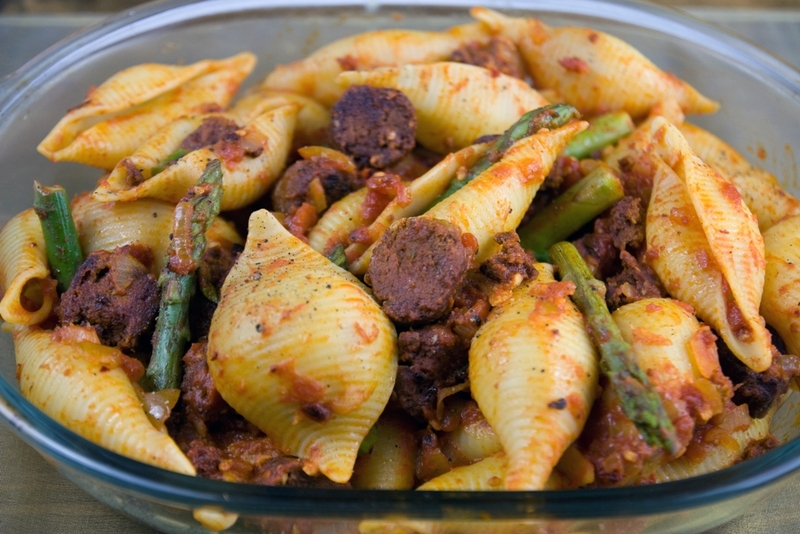 I love all things pasta and the chorizo sausage would really add a nice protein boost. Thank you Kimmy, so good to hear from you.